Happy Valentine's Day all! Hope your fake holiday of love is joyous, no matter how you spend it. This is my most recent piece for Connected Mom. How do you handle gender roles in your household? Do you children fit within the "normal model"? This weekend is my daughter's 3rd birthday. She's having a party and she couldn't be more excited to share the day with her friends. When we started thinking about her birthday a month or two ago, it was pretty easy to come up with a "theme" the she would love. I asked her if it was what she wanted, and she agreed happily, and continued to want the same theme ever since. 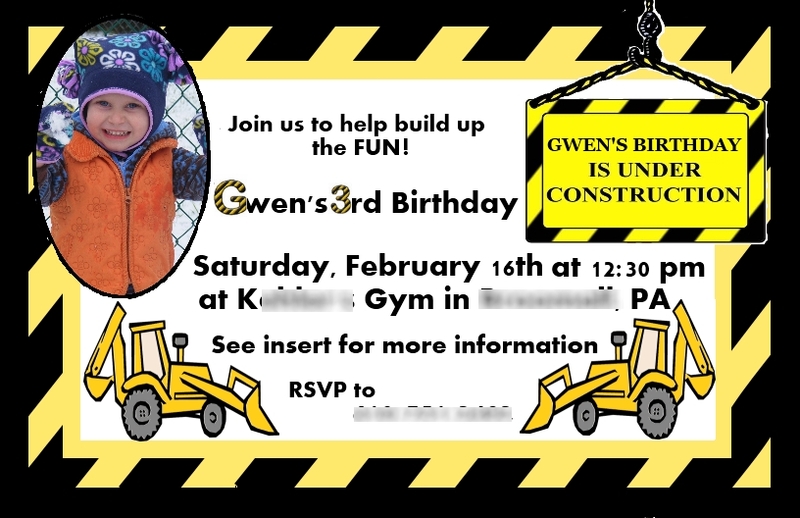 So, this weekend will be my daughter's Construction party. My daughter came upon her love of construction vehicles naturally. The major road that she and I drive when we go to visit my parents every month or so has been having work done for as long as she can remember (a multi-year, expansion project). Diggers are her favorite, and she gleefully points out every. single. one. along the drive. At daycare, she plays with her classmates with trucks... but also all sorts of toys, blocks, books, trains, puzzles, baby dolls, and in the play kitchen. I never really worried about gender stereotypes in our household. I don't like pink, my husband's favorite color is purple, we both love to cook, he cleans more then I do, and we both work outside of the home. Since my daughter was born, I've bought her clothes from the boys section and girls section equally. We never turn down a gift of clothes, no matter what the color, and whatever she chooses to wear in the morning is fine by me, so long as its weather appropriate. We're also blessed with family and friends that don't bat an eye when we answer their question of, "what does she want for Christmas?" with "Trucks!" She adores her two babies, Lily and Laura, and has the best time pounding away on her tool bench. I wonder if this is going to change as she gets older. Her interests will grow and change, for certain, but all I want is for her to know its okay to love whatever she loves, that her gender does not determine her interest, her actions, or her capabilities. I hope no one she meets, be it child or adult, will make her feel badly for choosing hobbies that are more traditional "boy" hobbies. And for my own part, I will do my best not to let my own interests or associations dissuade her from any traditionally "girl" hobbies. My girl, she is perfect when she is building tall towers with blocks while wearing pink dresses, and perfect when she is rocking her baby to sleep while wearing brown sweatpants and a blue hoodie, or a football uniform. How do you feel about gender roles in your household? Do your friends and family respect that? Do you feel moving beyond gender stereotypes is harder with a boy? I love that she's into trucks! We had a last minute invite to a little girl's first birthday party last year and had to come up with a present fast. Miles reminded me that we had a Hess truck in the closet still in the box (a duplicate gift from Christmas) so that's what she got! and she loved it! I really try to not enforce the gender stereotypes and just take my cue from them. My boys are pretty rough and tumble, but Miles still has a pink play kitchen and Skylar loves baby dolls and stuffed animals. Still, I think it is definitely harder for boys. I feel like it's only a matter of time, maybe when he goes to Kindergarten, when he'll refuse to play in his pink kitchen because it's "for girls". It's acceptable, even encouraged for a girl to be a "tom-boy", but if a boy shows any "feminine" traits everyone immediately worries that he could be gay! (which is a whole other issue I won't get into now!) But yeah, in general, I think the "boy", "man" stereotype is very rigid and can be very damaging if a boy feels he can't fit into that box or forces himself too. I touched on this in one of my blog posts a few weeks ago, about how gender roles are taught in movies. It's not enough to educate women to be strong and independent, we have to educate boys on the proper way to treat women, and that it's not a weakness to be vulnerable or sensitive. Gender stereotypes come into full force around the age they start school (in my experience, anyway) - it is developmentally appropriate for children to start noticing the differences between girls and boys at that age and with society's influence placed on top of that developmental milestone, "boy colors" and "girl colors", along with everything else, are born. Of course that doesn't mean we throw our hands up in the air and give in to the whole thing, but I have found myself being more flexible and taking it all a lot less personally. I talk to my kids about how colors are just colors, toys are just toys, and anyone can like anything they wish. I give them positive role models (remember, Uncle Sean's favorite color is purple! ), and offer suggestions for things to say when the kids at school try and enforce gender stereotypes, but I also understand that kids are just trying to be kids - not fight a huge battle against society.